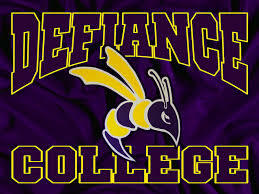 Defiance College, located in Defiance, Ohio, USA, is an independent, co-educational liberal arts college affiliated with the United Church of Christ. The campus includes eighteen buildings and access to the 200-acre Thoreau Wildlife Sanctuary. In recent years, Defiance College has gained national recognition for its programs of service and engagement. Defiance College̠s vision calls for an educational experience of engagement - civic, cultural, and learning - for all students.